The eighth book the the Pemberly Chronicles. 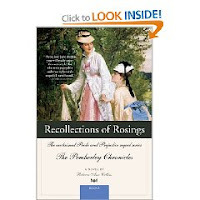 Recollections of Rosings is the story of Catherine Harrison and Becky Tate, sisters and daughters of Charlotte Lucus Collins. After a tragic fire at Rosings Park the story follows the sisters and the twists and turns their lives lead. If I were a betting girl I would bet that Catherine is a favorite of the author, Ms. Rebecca Ann Collins, due to the fact that she is so eloquently spotlighted and portrayed in this book. It was so easy to fall in love with her character! As Catherine returns to Rosings after the fire to find her husband injured, her daughter, Lilian finds love - but her Aunt Becky is unsure if it is the right love for her and tries to intervene. I was so impressed with Collins ability to write about the incidents in London at Lady Ashton's parties in a clean and modest fashion. Too many books I've read - even Jane Austen sequels include such incidents, as I'm sure they did happen during the time, but without leaving anything to the imagination or decency for the characters. I absolutely loved the journal entries that we were able to read from Catherine's past - they were so fascinating I felt like Catherine herself, wanting to stay up all night reading more and more. I still hold mixed feelings towards Becky Tate. Throughout half the book I had such a dislike for her and her character, she was just so shallow and petty! Then at the end when I read about her separation I did feel sad for her and was happy with the ending that was given her. I just received my advanced copy from the publisher of the next book in this series, A Woman of Influence, in which Becky is a main character. I cannot wait to dive into and read the rest of her story. Recollections of Rosings does not disappoint. Rebecca Ann Collins is able to create a world of characters that can be loved and cherished. These books are my "feel good" books that I go to anytime I need a good book for a pick-me-up. This sounds like a great read and I would really like to get hold of it. I quite enjoy post jane Austen literature as chill out reading..... I have recently read a collection of short stories called "Dancing with Mr Darcy" - all inspired by Jane Austen - which you might enjoy.